If anyone has not yet read the testimony of Archbishop Vigano, I recommend it as an important piece of evidence. The 11 page document is easily found on the internet in written form, or may be listened to read by Fr Zuhlsdorf on his blog. I read it on Tuesday after returning from a weekend in Walsingham and elsewhere, and thought that it was explosive evidence very detrimental to Pope Francis and several other high ranking clergy. I then searched the internet for comment and analysis, and found that almost everyone was defending Pope Francis and picking holes in Archbishop Vigano's evidence. 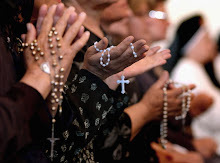 Some fairly reasonable points were raised which did cast some doubts in my mind about the adequacy of some parts of Archbishop Vigano's evidence. Finally, I reread the testimony, and my ultimate conclusion is that the Archbishop is correct in every detail. The testimony is, for the most part, very detailed, giving dates, places and the actual words of some of his conversations. My first reason for believing Archbishop Vigano is because of the amount of detail given. Secondly, I believe the details of the evidence because they contain so many surprises. There are episodes recounted that, at first sight, seem unlikely, and on reflection are indeed so unlikely that it is difficult to believe that anyone would have made them up. The numerous people who have come to Pope Francis's defence, led in this country by Austen Ivereigh, have not impressed me with their arguments. Some of the arguments are well presented, but they all have the hallmark of being orchestrated and very much on the defensive. It seems as if someone has been managing the responses. As a rule, I do not comment on controversial issues on this blog, preferring to keep to purely factual matters. On this occasion, I have made an exception because the subject matter is so grave, and because, after several days consideration I have become convinced of the reliability of Archbishop Vigaro's testimony. The pilgrimage in honour of St Margaret Clitherow and the Martyrs of York will take place on Saturday, 1st September. Pilgrims should assemble at the Bar Convent at 10.30am for a 10.45 departure on foot for Ouse Bridge, where Margaret Clitherow was executed, and The Shambles, where she lived and a house has been made into a shrine to her. The procession will continue to St Wilfrid's Church where there will be Mass in the Extraordinary Form at 12.10pm. Benediction will follow. There will be a Sung Latin Mass for the Feast of the Assumption at St Wilfrid's Church in York on Wednesday 15th August at 6pm. Those who do not feel able to walk the 57 miles from Ely to Walsingham, there is another option. Pilgrims can make their own way to Walsingham on the Sunday. There will be a Solemn Mass in the Chapel of Reconciliation at 2.00pm on the Sunday. Pilgrims can then walk the Holy Mile to the Abbey grounds where there will be devotions. The annual walking pilgrimage to Walsingham organised by the Latin Mass Society will take place over the August bank holiday weekend, starting in Ely in the evening of Thursday 23rd August and arriving at Walsingham around midday on Sunday 26th August. Accommodation in the form of a campsite for men and floor space in a hall for women is provided each night, with evening meal and breakfast also provided. Pilgrims assemble on the Thursday evening at Ely, and set off after early Mass on the Friday. 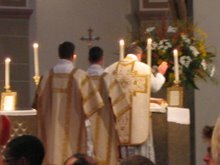 Full details and the booking arrangements can be found on the Latin Mass Society website.